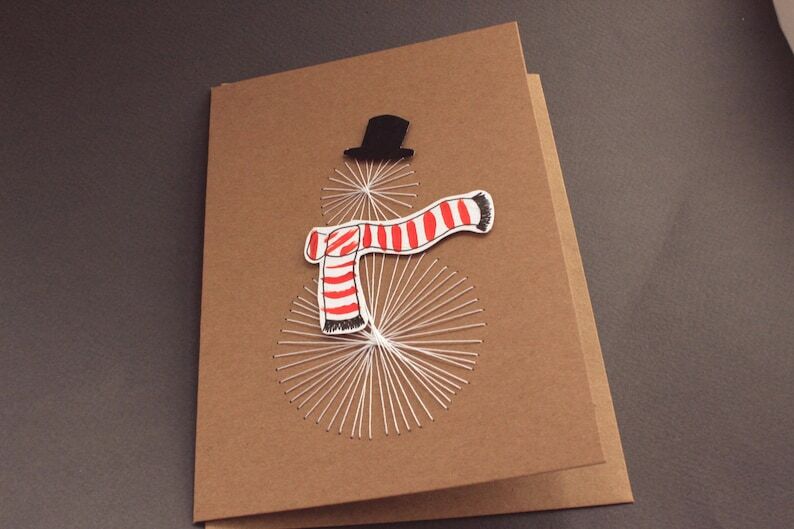 This threaded snowman card has been hand stitched into the shape of a snowman, and he has a scarf and hat to keep him warm on your mantelpiece. The front of this card is entirely handmade. The card is made with 240gsm Kraft Card, the folded card is 5inx7in. All cards are blank inside and come with a kraft envelope. Order 1 or more! These cards are handmade, so sizes, arrangement, card details may differ. If you would like a message written inside and be sent straight to the recipient, please write in the notes. This Product is currently branded as Fay Dixon Design, more designs can be found at http://faydixondesign.co.uk. All handmade cards are created in the Midlands, UK. Lovely cards of excellent quality that arrived well packaged. Many thanks. The heart shape on the card I received was lopsided very uneven. I understand that these cards are handmade so each one is going to look a little different but it would have been nice to see the card look at least a little more like the picture. If you haven't selected tracked delivery, I can't tell you exactly where your order is. For UK orders you need to wait for at least 12 working days after despatch before I can refund, and everywhere else is at least 25 working days after expected delivery date.